Paramount’s (Viacom, Inc.) Teenage Mutant Ninja Turtles turtle-powered its way to a terrific $25 million opening Friday, including $4.6m on Thursday. Brief digression: For a summer box office that’s allegedly in some kind of slump, this is the fourth week of terrific debuts for the would-be new release. Will pundits still cry foul if this August turns out to be the biggest on record? 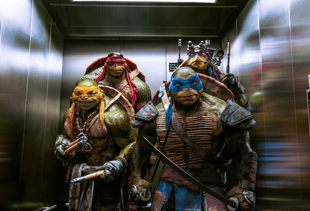 Anyway, Teenage Mutant Ninja Turtles, the $125m franchise reboot produced by Michael Bay, directed by Jonathan Liebesman, and starring Megan Fox, was projected to open at around $40-$45m over its debut weekend. But even with poor reviews and Guardians of the Galaxy offering buzz-stealing competition, the TMNT revamp is on track to earn around $60-65m for the weekend. This is frankly the kind of “We should have seen this coming!” box office surprise that makes this game fun. The big question for the weekend is how much the film plays like a kid-centric hit (with really strong Saturday matinee business and thus a higher multiplier) or a general hit (with the now standard 2.5x multiplier). 2.5x gives the film a robust $64m while 2.75x gives the film a somewhat insane $70m for the frame. But either way this is a dynamite debut weekend for a project that was the object of scorn from the moment of its inception. What was Paramount’s marketing strategy? No Fear. They didn’t respond to critics and pundits decrying Michael Bay as the ruiner of childhoods, the weird new designs, or who was or wasn’t playing Shredder and if the turtles were or were not aliens. Paramount knew that the vast majority of moviegoers (and in this case younger moviegoers who discovered the title characters through the newest animated incarnation) weren’t going to care about that stuff, even if a clearly “tinkered and re-shot in post production” final product implies that someone did.